Unleash Them: MAE Re-Signs with Tooth & Nail Records, Check Out Single for “5 Light Years” here, on Tour this Fall! American rock band, MAE, has re-signed to Tooth & Nail Records. They will be releasing their highly anticipated record, produced by lead vocalist Dave Elkins, this fall on the label. The band released their first two records, Destination: Beautifuland The Everglow as well as previous EPs on Tooth & Nail, and is very excited to return to their roots. Additionally, last week, MAE released the first single off of the forthcoming record, “5 Light Years,” which is available to listen to HERE. “The most compelling stories invite you into a transformation and reveal a new perspective. In this record we go on a journey from separation to connection. ‘5 Light Years’ takes people into the heart of that story and welcomes them to a new beginning,” MAE shares on the new track. (m)ultisensory (a)esthetic (e)xperience, more commonly known as MAE, is an ever-evolving music and art project formed in 2001. The band has done it all – from signing with established labels to self-releasing music. In 2009, the band even released a set of EPs on their own label entitled Cell Records, in which all proceeds benefited Habitat for Humanity and DonorsChoose.org. 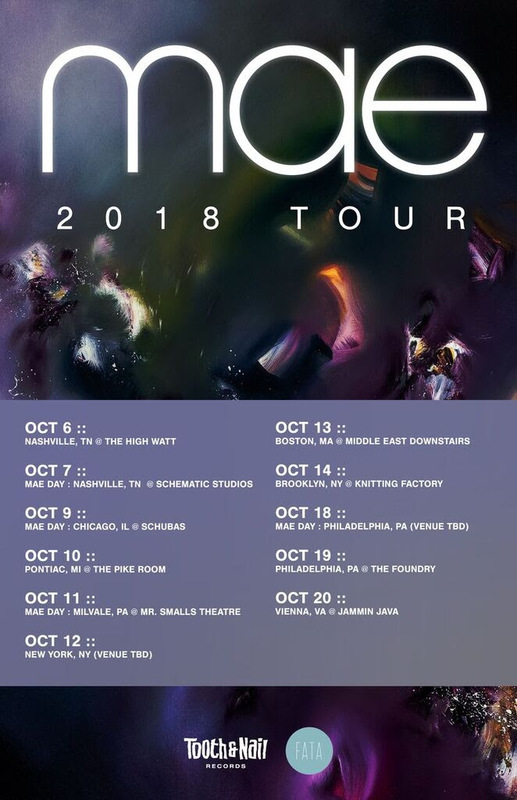 With a critically acclaimed career spanning over 1600 concerts on 4 continents and 8 studio record selling in excess of 500,000, MAE consistently weaves together expansive cinematic soundscapes for the emerging global culture. Born out of funded academic research on the relationship between color and sound, MAE uses its music as a starting point to extend the concept of harmony to include other sensory languages and place listeners inside of an experience of art for the whole body. MAE have shared the stage with iconic bands such as Weezer and The Foo Fighters, toured worldwide, and have performed everywhere from the Vans Warped Tour to the United Nations. MAE also made history when they placed 700 people inside of a group virtual reality experience while they closed out the Forbes Under 30 Summit in Jerusalem’s Tower of David. MAE’s previous album Singularity came in at #40 on the Billboard Top 200 Chart, #12 on the Billboard US Rock Chart, #13 on the Billboard US Alternative Chart, and #40 on the Billboard US Digital Chart.